Only one flag has ever represented the state of Indiana, and it has only existed for approximately half of the state's time in the Union. 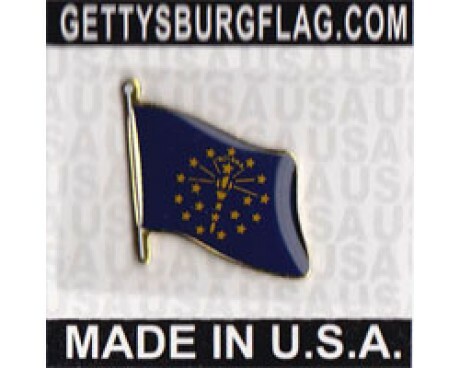 The Indiana state flag was designed in order to represent the state's centennial anniversary, and it has represented the state for approximately one hundred years since that time. The state flag of Indiana has a solid blue field that is emblazoned with a golden torch and several rings of golden stars. The torch was chosen to represent both intellectual enlightenment and liberty, and each set of the stars around the torch has its own meaning. The largest group has nineteen stars, which honors Indiana's place as the nineteenth state to be admitted into the United States of America. A smaller group of thirteen stars represents the original thirteen colonies that joined together to create the United States, while the smallest group of five stars honors the five states that joined the Union shortly after Indiana. A single star that is larger than the others is directly above the torch, and it serves as a symbol of Indiana itself. The state's name wraps around the upper portion of that star, which clarifies its meaning. 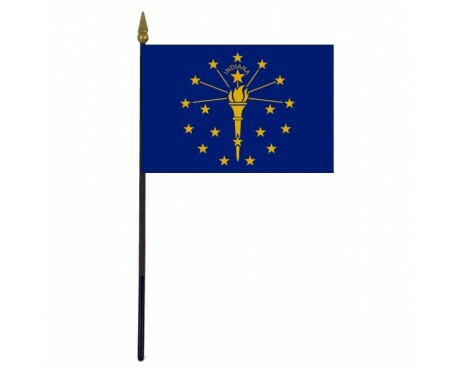 There were no Indiana state flags until the state celebrated its centennial anniversary in 1916. The Daughters of the American Revolution held a contest to find the flag's design at the state government's request, and they received more than two hundred potential Indiana state flags. 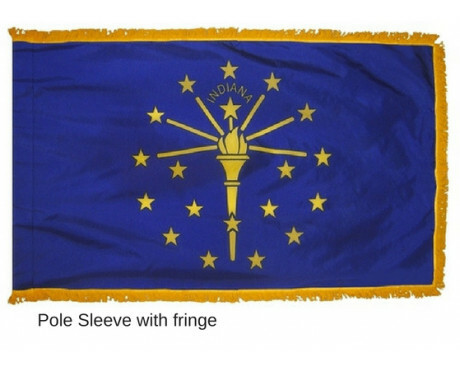 Paul Hadley's design for the state flag of Indiana was eventually selected, although it was changed slightly before adoption. The original design did not include the state's name, which was added before the design was approved. The design was originally adopted as a state banner rather than a state flag, although the difference between the two classifications was largely semantic. The dimensions of the Indiana state flag were standardized in 1955. No changes were made to the flag's design apart from the dimensions at the time, although the government did reclassify it as a state flag. 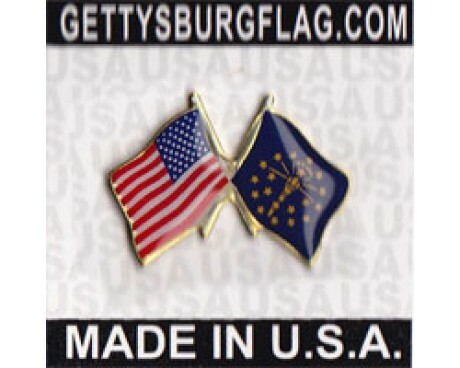 The 1955 law was the last time that the government of Indiana made any alterations to the flag. 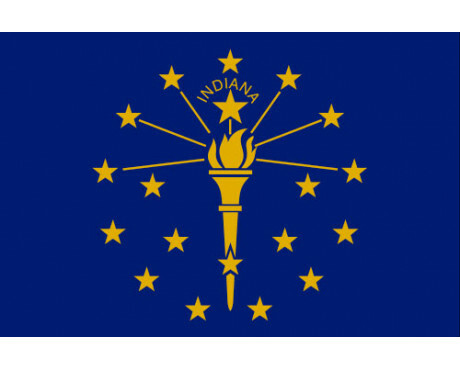 The state of Indiana officially has two flags, although the second is commonly used. This is because until 1901 there was no state flag, and it was decided to adopt the Stars and Stripes to serve the purpose. In 1916, the Daughters of the American Revolution ran a competition for the design of a state flag. The current design was done by Paul Hadley, and was approved by the state legislature in May 1917, and was adopted in 1955. The law of 1901 adopting the Stars and Stripes was never repealed, and therefore leaves the state with two official flags. Hadley's design shows the torch of Liberty surrounded by an outer ring of 13 stars, which represents the original states with inner ring of five stars to represent the next five states admitted to the Union. 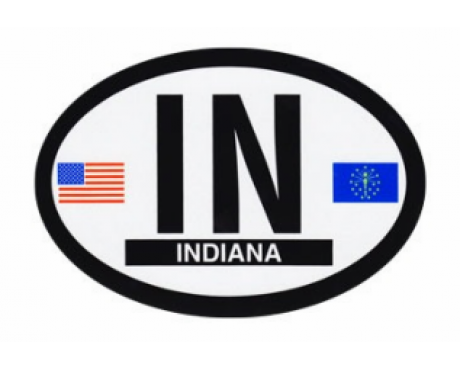 The name of the state is placed above a larger single star, which represents Indiana. The state seal of Indiana is extremely complex and hasn't been altered since its inception in 1801, a year after they became a territory. Indiana is similar in many ways to Illinois, and was first explored by the French. Settlements were made in 1732-33, and was ceded to Britain in 1763 as Indiana Territory. Indiana became a Territory of its own right in 1800. On December 11, 1816 Indiana was admitted to the Union.